Yasiel Puig spends time with a little league team at Dodger Stadium. Yasiel Puig’s time with the pee wees looks like it hasn’t ended. 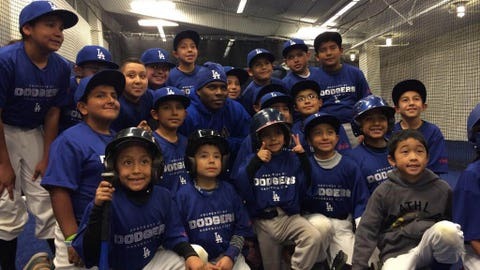 Just weeks after the Dodgers’ star outfielder treated 50 players (ages 9-12) of the Northeast Los Angeles Little League team to a visit to Dodger Stadium that included batting practice and a tour of the team’s clubhouse, Puig was at it again. This time, he was on the mound at Dodger Stadium, pitching to an older group of kids playing a little pickup game. At one point, Puig had to dive out of harm’s way after a comebacker nearly hit him in the shin. Puig can keep the VIP treatment for the kids (he also paid a recent visit to Children’s Hospital Los Angeles with Pau Gasol), but should stick to playing in outfield during games.